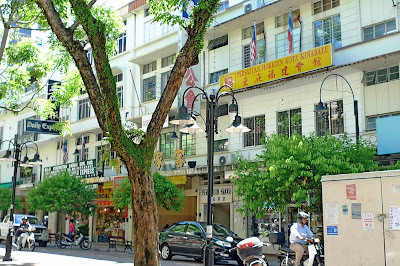 Gaya Street or Jalan Gaya is one of the most famous streets in KK town. Formerly known as Bond Street, it is also one of the busiest streets in this town. I had the opportunity to visit it on my 3rd day in KK. After I left the Atkinson Clock Tower at 9am, I realised I had many hours left before the pick up van arrive at 1pm for my Klias Wetland Tour to see the proboscis monkeys. I decided to have a leisurely walk along Gaya Street. 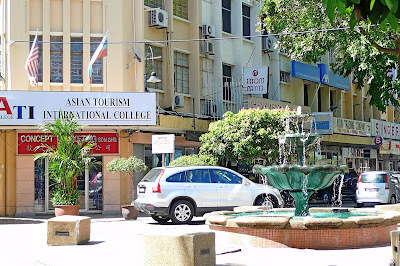 One of the first buildings I saw on Gaya Street was the Sabah Tourism Board. If you had read my earlier post, you would have known that I went into this building to enquire about the tarap fruit that I've been trying to find. Do you know that this nice looking building was constructed in 1916 and it survived the Allied bombings during World War 2? 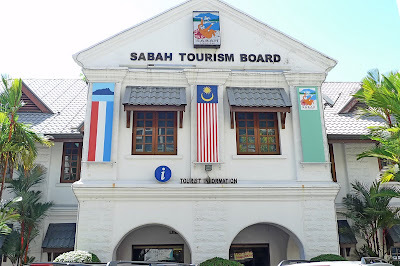 It was gazetted as a heritage building and officially became the Sabah Tourism Building in January 1991. 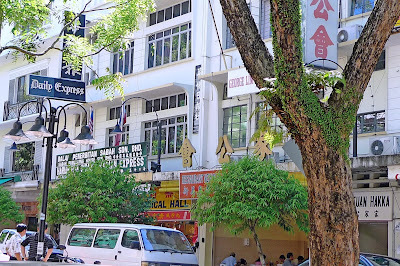 Walking along the road, I soon reached a junction and it was here I saw the famous Jesselton Hotel. Established in 1954 when KK was then known by its colonial name Jesselton, this hotel has the distinction of being KK's oldest hotel. Despite that, it has managed to retain the serenity of bygone days, while offering the conveniences of a modern hotel. 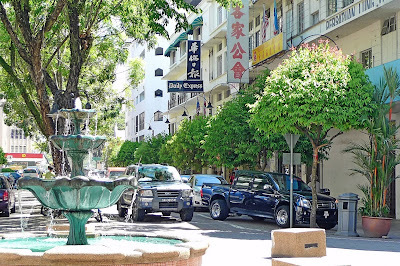 It was completely refurbished in the mid 1990's and today stand as the only premier boutique hotel in KK, and possibly one of Malaysia's leading boutique hotels. Walking further along Gaya Street, I came across the Daily Express office. Daily Express, by the way is the largest circulation daily newspaper in Sabah. Known as an independent newspaper of East Malaysia, it first hit the streets on March 1, 1963. It is published in 3 languages - English, Bahasa Malaysia and Kadazan. Like the famous The Star Online, now you can read the latest news concerning KK on Daily Express Online. A few shoplots away from Daily Express, I saw one of the well known NGOs in KK - Persatuan Hokkien Kota Kinabalu or the Kota Kinabalu Hokkien Club. I noticed that this Gaya Street was a really busy street with lots of cars and people. Well, it is no wonder that this area is the centre of business in KK. There are many businesses here that had been passed from one generation to the next. The older folks would remember well the wooden shops with nipah roofs now being replaced by modern buildings lining the street. Walking further, I reached a small roundabout with a nice looking water fountain in the middle. There is a tourism college here as you can see from the photo. Not a bad idea to have a tourism school in a popular tourist town! It was a pity I did not have the opportunity to walk along Gaya Street on Sunday as I would have already left KK by then. Every Sunday, the entire length of Gaya Street would be closed off to traffic to make way for the Sunday Market. To the locals and tourists alike, this market is known as the Gaya Street Fair or simply Gaya Market. It is reported that you can find almost anything there. For write-ups and photos of the Gaya Market, you might want to visit QuaChee's blog. I missed Gaya Street and the Sunday market the last time I was in KK. When I travel, I like visiting the local markets. I loved the dim sum at Gaya Street. So yum-yum! That's the only street in KK town you can find many better Chinese coffee shops. Very crowded there on Sunday as the market is selling a lot of things from handicrafts, foods, tools...etc. I was there for a short one hour only as need to catch a flight. what a pity. I had a business trip to Sabah last year. I wrote a post in which I touched on the various names of the state capital. Before the arrival of the Britons the city was known as Api-api. During colonial time it was Jesselton. After independence it became Kota Kinabalu. I absolutely hate the new name. Why? Because my home town is KK too! Hiya Foong ...KK seems to be a charming place, thanks for the write ups. Very useful for future trips. did u went to filipino market? Foong, do you have prob accessing your blogger profile this morning? I can't access mine. And I cannot post anything. Can only leave comments. mei teng, morning! As usual you are FC here. Yeah, we both missed the Sunday market. Maybe next time I go KK, will go on a weekend so I can visit the market! khengsiong, went to read your post. Too bad Kota Kinabalu hijacked KK initials from your hometown Kuala Kangsar! haha! annant, oh you are going KK? Wish I can be there! Staying in Lavender Lodge too? Cool! Yes, I visited the Filipino market, though I think their stuffs were quite pricey, obviously aiming at foreign tourists! Seems like a nice place to visit! I passed there so many times and didn't even know it's Gaya Street. I like KK very much for its spacious feeling and relaxed townfolks. You didn't go on a Sunday morning? That's when they have the tamu - Sunday market and that's the time when Gaya Street is the most interesting! Didn;t go to the islands, did you? Awwww.... Now you'll have to go to KK again.... LOL!!! and i supposed the Sunday Market would be more interesting than Gaya Street itself for tourists?? We don't have that in Singapore. But there are some conservation monuments from colonial times around the island. Gaya Street looks like a nice and peaceful place from the photograph you presented. KK looks like a very peaceful place. It's beautiful and orderly. I'm not surprised if you enjoyed your backpack trip. suituapui, how did you know I didn't go to the islands? In fact, I did and I will blog about it soon. Yes, miss the Sunday Market as I initially only planned to climb Mount Kinabalu and didn't take into consideration of the Sunday market. SK, the Sunday market should be a very interesting place to visit for tourists although Gaya Street is in itself an attraction. Too bad you missed the sunday market, it's really fun going to market fairs because of great bargains. Well at least you got a good leisurely walk. Nice photos and very informative, have a great night (i believe it's night there now) foong! monica, I thought they told me that during CNY, they even have lion dance at Gaya Street, no? Thank you for sharing your views of a city that I would never get a chance to see otherwise. Gaya street only for gaya people! lol.. It's too bad you couldn't visit the fair. It is kinda cool actually, but oh well maybe next time? AirAsia currently got 0 fare now also! Go check, check, check! The Jesselton Hotel sure caught my attention. Love the decos inside boutique hotels hehe. meandtheblueskies, you are welcome! Long time no hear! How are you? eiling, 'Gaya' people only can walk the Gaya Street? So I very 'gaya' lah! Haha! JL, I think you should just take any photos you think will make your posts about your KL visit more interesting. Buildings, food, people. Anything! But I would love it if you can take pics of Bintang Walk and the surrounding place. Btw, where will you be visiting in KL? monica, didn't see? I guess maybe it's at a different time? Congrats again - I think this is the first time you become FC here, right? You're are the first blogger i know who's willing to take time and reply his readers' comments one by one. wow..what a great response to this post.. syabas! I was there in the Gaya Street Sunday market a few years back. You are right, virtually anything can be found there! tekkaus, morning! OMG! What are doing at this unearthly hour visiting my blog? It's 4.45am! You just woke up or you stayed up all night? I love these pictures. They are so vibrant with colors and life. That walk must have been a lot of fun, Foong. 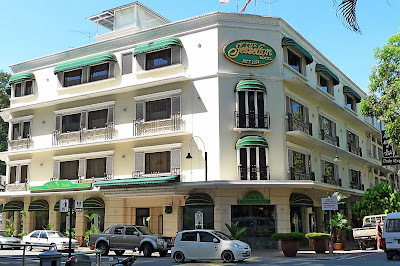 Did you check out the Jesselton Hotel? One of the best boutique hotels in Malaysia? Really? happysurfer, yes I enjoyed the walk along the street and take pictures. Felt like a complete foreign tourist! Yes, I just took a quick walk inside the hotel but did not take any photos. I'm not really sure if it's one of the best boutique hotels since I haven't been to that many boutique hotels myself! But that's what they claimed. It is common that women are fond of jewelries, but they seldom wear them except on some exceptional occasions. Unlike jewelries, watches are daily stuff that we wear every day. Hence, it is not strange that watches are given a high to most women.